On February 27th, 2019 the chapter is co-sponsoring a poster contest and career panel networking event. The event will run from 11:00 AM to 2:30 and includes complimentary lunch. See a copy of our informational poster in the link below for more information. We hope to see you there! NJDEP/A&WMA 17th Annual Regulatory Update Conference - The NCNJ Chapter of A&WMA was proud to co-sponsor with NJDEP this annual event - one that gives the regulated community the opportunity to hear firsthand from senior NJDEP personnel about the latest environmental regulatory initiatives. Thank you to all who attended and asked great questions. Please see below for copies of each presentation. "New Jersey Surface Water Quality and Ground Water Quality Standards Update"
"Resiliency and Air Toxics Rule"
"Site Remediation and Waste Management Program Update"
"Funding to Reduce Mobile Source Emissions"
"2018 Update on Current and Recent Research"
"Compliance and Enforcement Updates and other Holiday Treats"
​On March 7th, 2018 the chapter is co-sponsoring a poster contest and career panel networking event. The event will run from 11:00 AM to 2:30 and includes complimentary lunch. See a copy of our informational poster in the link below for more information. We hope to see you there! Thank you to all who participated in our recent webinar on PFAS. Special thanks to Gloria Post (NJDEP) and Jim Occhialaii (Alpha Analytical) for providing us with their valuable perspectives. Please see the link below for copies of the presentations. NJDEP/A&WMA 16th Annual Regulatory Update Conference The NCNJ Chapter of A&WMA is proud to co-sponsor with NJDEP this annual event that gives the regulated community the opportunity to hear firsthand from senior NJDEP personnel about the latest environmental regulatory initiatives. 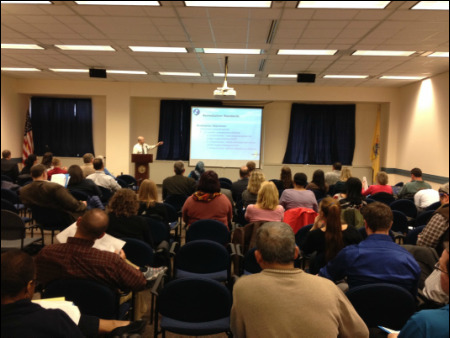 This one-day conference was held on Friday, November 17, 2017 at NJDEP Headquarters. Public Hearing Room, NJDEP Headquarters, 401 E. State Street, Trenton, NJ. The NCNJ Chapter of A&WMA is proud to co-sponsor with the NJDEP this annual event that gives the regulated community the opportunity to hear first hand from senior NJDEP personnel about the latest environmental regulatory initiatives. A&WMA NCNJ Chapter's 20th Anniversary Celebration! Second Annual Mini-Conference "Pursuing a Successful Career in Science" and Student Poster Competition! "From Student to Professor: What is an Academic Job and how to get it"
"Career Choices with a PhD in an Environmental Field and STEM in General"
Dr. Yevgen Nazarenko: "Nanoparticles, Sources, Monitoring Methods, and Potential Health Impacts". Diana Ortiz-Montalvo, Ph.D. candidate: "Cloud Chemistry and Droplet Evaporation: Formation of Secondary Organic Particles". Mini-Conference "Pursuing a Successful Career in Science" and Student Poster Competition! "Microbial Community Structure: Changes in a Wildfire Impacted Forest Soil May Reflect the Alternate State Hypothesis"
"Effect of Aerosolization and Sampling on Cell Integrity of Escherichia coli"
"Use of carbon dating, LOI and vegetational changes to determine carbon sequestration rates with ecosystem history in the Hackensack Meadowlands, New Jersey". 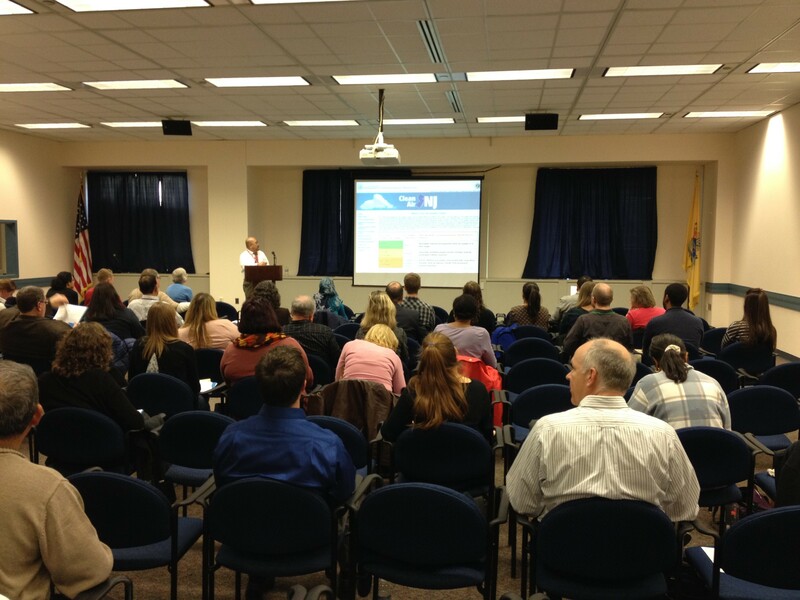 Topics: NJDEP's upcoming air, waste, and environmental initiatives. Breakfast Seminar " Our Energy Regulation Future - Where Do We Go From Here?" Location: Trenton, NJ at the NJ Chamber of Commerce. Captain Aleksandr Modjeski and his topic "Lower Passaic River Low Resolution Coring Program"
Tour of J&J Solar Cell facility and discussion of energy master plan for the State of NJ, alternative energy and potential environmental impacts, and the corporate business case for energy efficiency. Executive Dean Robert M. Goodman introduced some of the most outstanding interdisciplinary programs and projects in which students and faculty are engaged. A tour of the Rutgers EcoComplex followed the presentation. Dr. James Blando of the New Jersey Department of Health and Senior Services gave a presentation on current studies in Nuclear Emergency Preparedness in New Jersey. We also presented the scholarship awards to the 2007 winners. Dr. Christos Christodoulatos of Stevens Institute of Technology was the keynote speaker for the evening and gave a presentation on tungsten in the environment. Location: Union County Utilities Authority's (UCUA) Resource Recovery Facility on Route 1 in Rahway. Speakers and Topics: Sunil Garg, Executive Director of the UCUA preceded a brief plant tour by Alan Harleston of Covanta Union, Inc. Covanta. We toured the Hampton-Clarke/Veritech (HCV) Laboratory in Fairfield, NJ and found out what happens with your Environmental Samples when you send them off to a lab. Tom Cady, Vice President of Analytical Services gave a brief presentation describing the laboratory procedures and analyses. We then broke into smaller groups to tour the lab showing the various stages of sample acceptance/storage, instrument preparation/extraction area, and analytical instrumentation. The NCNJ Chapter hosted a dinner meeting at Rutgers University in cooperation with the Rutgers Environmental Science Club and the Rutgers Meteorology Club. Dr. Alan Robock, Professor in the Department of Environmental Sciences was the guest speaker and the topic for his presentation was climate change and global warming. Here are a few photos from the event: Photo1; Photo2; Photo3; Photo4; Photo5; Photo6; Photo7; Photo8. The Mid-Atlantic States Section of the Air & Waste Management Association (MASS-A&WMA) hosted a meeting at the Bethlehem Brew Works (569 Main Street, Bethlehem PA, 18018). A general meeting was held to elect officers and directors for the section followed by dinner and a presentation on Global Warming and the Human Impacts of Climate Change presented by Dr. Alan Robock of Rutgers University. While it was mild and 60 degrees, the November 13, 2006 golf outing was canceled due to 48 hours of continuous rain that hit the northeast. Future make-up dates are being assessed for a spring event at Eagle Ridge Golf Club in Lakewood, NJ. 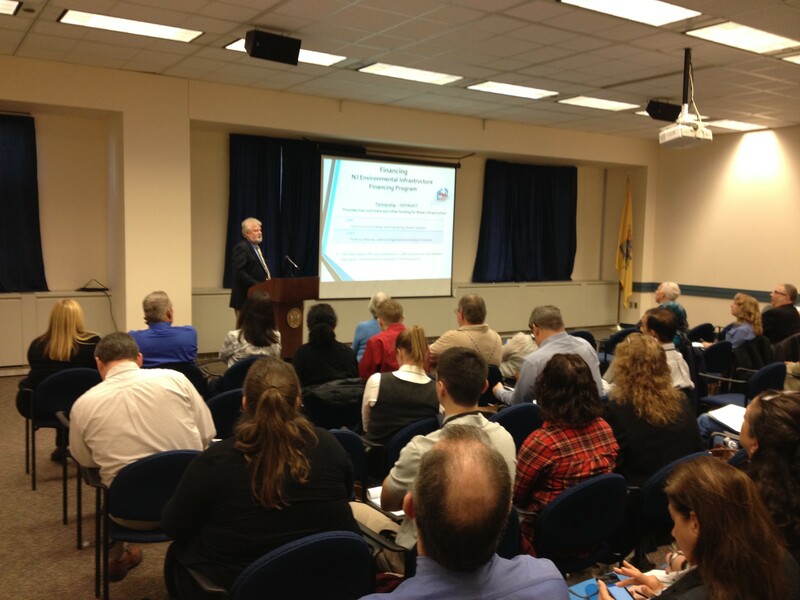 The NCNJ Chapter hosted a full-day fall regulatory conference in the 1st Floor Public Hearing Room at the NJDEP Headquarters building in Trenton, NJ. The event include speakers from the New Jersey Department of Environmental Protection and Department of Health and Senior Services. Additional information can be found on the FALL CONFERENCE web page. Click here for the Conference Flyer (PDF File; 27 KB). The NCNJ Chapter hosted a breakfast meeting at the Days Hotel and Conference Center (formerly Ramada Inn) in East Brunswick, NJ. Mr. Robert Adams of ENVIRON International Corporation gave a presentation on the ambient air monitoring programs during the clean-up of the World Trade Center disaster. The NCNJ Chapter hosted a planning picnic and elections at Rooveselt Park in Edison, NJ. Check out the Board Members page on this web site for the list of current board members. The Mid-Atlantic States Section of the Air & Waste Management Association (MASS-A&WMA) hosted a full-day technical conference, sponsored by Johnson & Johnson, at the Hyatt Regency in New Brunswick, New Jersey. The conference focused on Consumer Products and Pharmaceuticals in the Environment, Nanotechnology, Voluntary Programs, and Environmental Self Regulation. The NCNJ Chapter hosted a lunchtime event at the Union County Utilities Authority’s Resource Recovery Facility on Routes 1 & 9 in Rahway. The event consist of an overview of waste incinerator operations provided by UCUA/Covanta, followed by a brief tour of the Resource Recovery Facility. The NCNJ Chapter hosted a regulatory update workshop on Friday February 10, 2006 in the 1st Floor Public Hearing Room of the New Jersey Department of Environmental Protection's (NJDEP) Headquarters building in Trenton, NJ. For more information, including pictures and copies of the presentations, please visit the event page. The NCNJ Chapter held a joint meeting with the Rutgers University Environmental Science and Meteorology Clubs. Dr. Alan Robock, a professor in the Department of Environmental Sciences at Rutgers University gave a presentation on the human impacts of climate change. In addition, details on the NCNJ's 2006 undergraduate scholarships were announced that evening. Click here for PICTURES of the event. 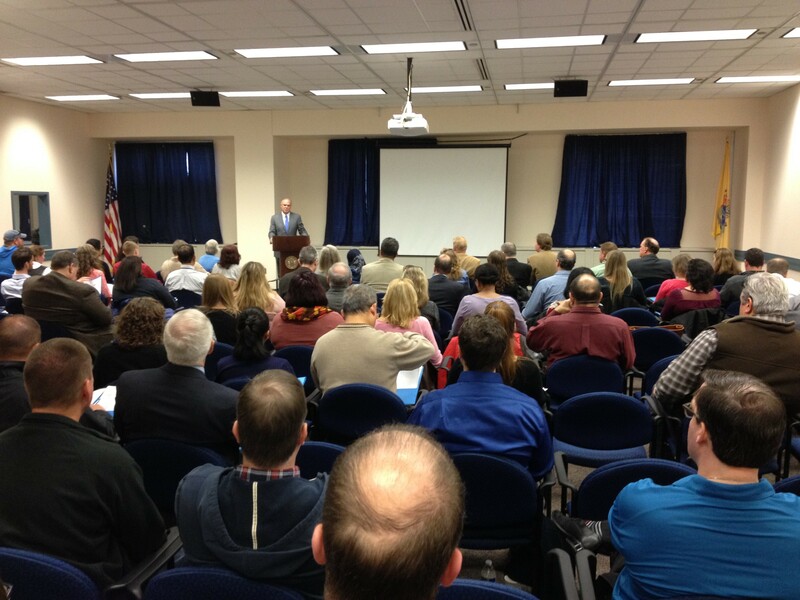 Fall Regulatory Conference at New Jersey DEP Headquarters Building in Trenton. Conference details and photographs are provided on the 2005 Fall Regulatory Conference webpage. The September chapter meeting was held at the Bergen County Utilities Authority (BCUA) in Little Ferry, NJ. Mr. Thomas Mattei of Avogadro Environmental Corporation gave a presentation on continuous emission monitors (CEMS), continuous opacity monitors (COMS), and stack testing requirements. Following the presentation, the BCUA provided a brief plant tour of the wastewater treatment operations on site. A special note of thanks is provided to the BCUA for hosting the event and providing an informative overview of the facility's operations. Click here for PICTURES of the event. A summer planning/barbeque meeting was held in Upper Montclair, NJ. Events for the Fall of 2005 and Spring of 2006 were discussed. Scholarships and conferences were also among the key topics addressed.